Using the Babyville PUL fabric from Joanns. 100% Cotton Flannel or other soft absorbant fabric for the outer layers. I used pink flannel. You can also use an old flannel shirt or pj's. 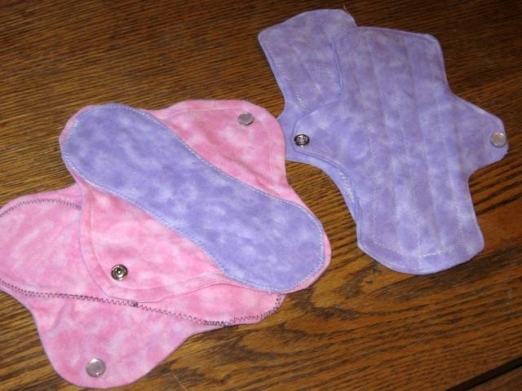 If you buy 3/8 yard, it is enough for about three pads. This fabric will be next to your skin, so choose something soft. 100% Cotton Batting for the inner layers. I used Warm & Natural. 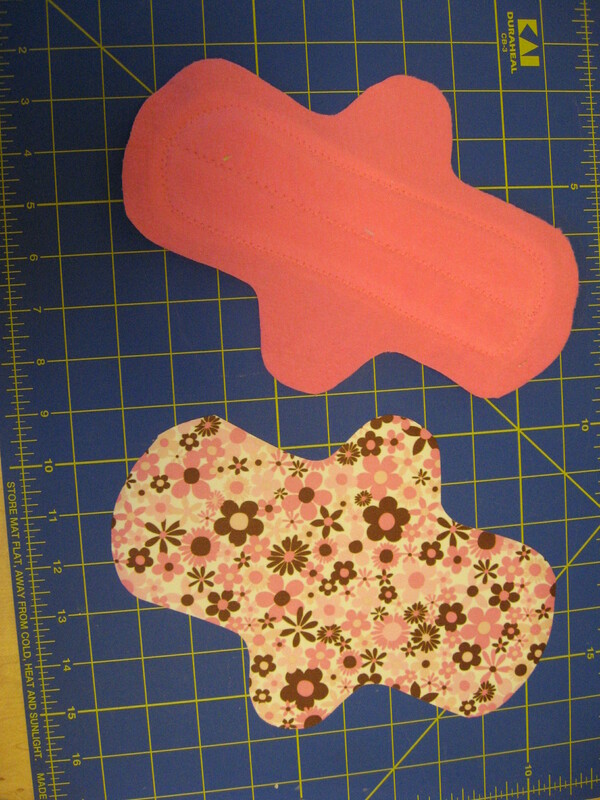 3/8 yards will be enough for about three or four pads. 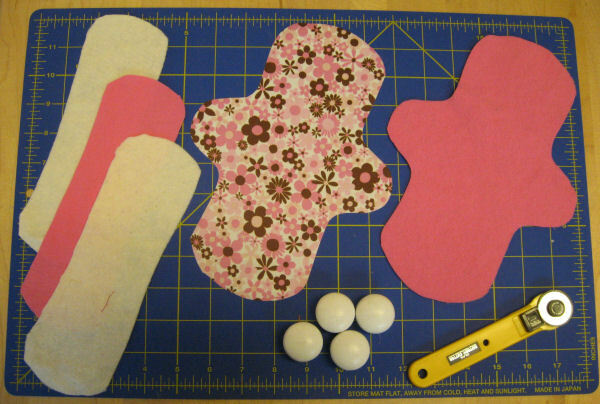 You could also cut these pieces from a cotton hand or bath towel. Babyville PUL fabric. This line of fabric is sold at Joann Fabrics, and is promoted for making cloth diapers. It's what I've used for the pink pads on this page. You could also use a different waterproof or water-resistant fabric, if desired. There are many waterproof fabrics on the market, from nylon with a polyurethane coating, (often called PUL) to high-tech fabrics like Ultrex and Wind Pro fleece. The Green Pepper sells a variety of such fabrics and, while they don't have their fabrics on-line, they have a very informative catalog. The Rain Shed also stocks many high-tech waterproof fabrics. A snap fastener. I use one four-part snap. You can buy a pack of these, with a small attachment device included, at fabric stores. Don't bother with the snap pliers, they are expensive and do not work as well as using the small device and a hammer. (I have not used the plastic snaps; they seem more expensive and I've never had problems with the metal ones.) 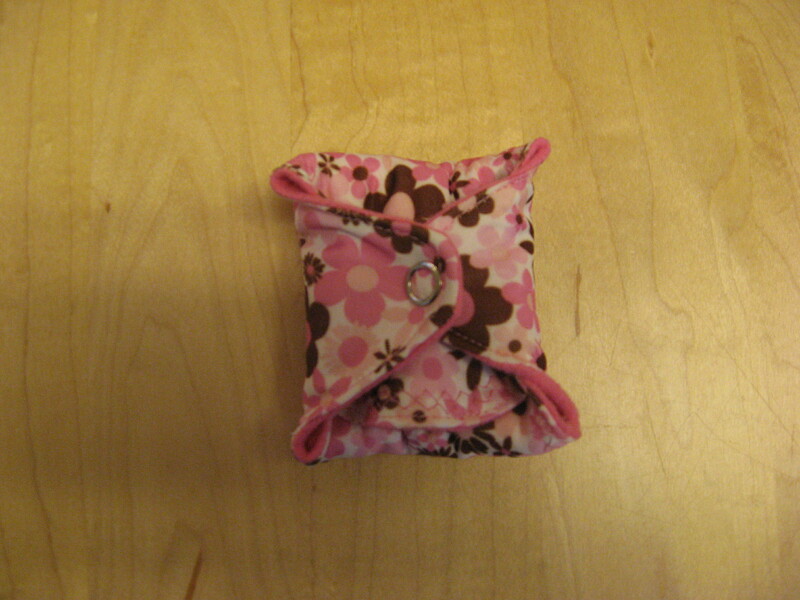 Or you could use a sew-on snap, hook-and-loop tape (VelcroTM), or a button and buttonhole. (I'm not a fan of Velcro, because it sticks to everything in the wash, and will probably wear out sooner than the rest of the pad. Some folks use the plastic snaps. ~ Wash your flannel in hot water to pre-shrink it before sewing. I also like to wash the PUL in cold, just so that it is nice and fresh. I don't pre-shrink my batting, and it hasn't been a problem. ~ Take a look at the pattern picture - There are two pattern pieces - the outer layer, which has the wings, and the inner absorbent layer - sort of on top of each other on the same page. Print out two copies of the master pattern page, so you can cut the outer layer pattern from one and the inner layer pattern from the other. 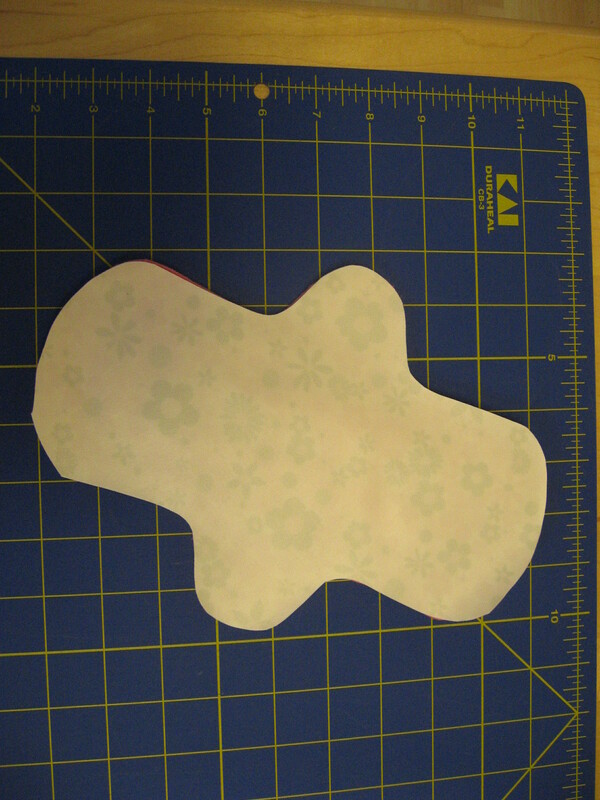 ~ Cut one large outer piece from the floral PUL fabric. ~ Cut one large outer piece from the pink flannel. 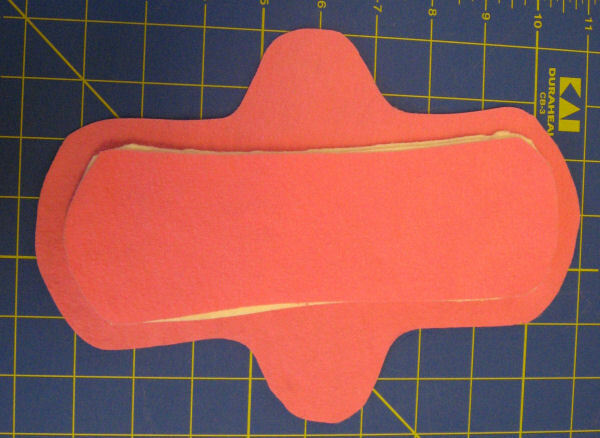 ~ Cut one smaller inner piece from the pink flannel. ~ Cut two smaller inner pieces from the warm-and-natural batting. To cut my pieces, I use a small Olfa rotary cutter, and Olfa cutting board. When cutting, I hold my fabric down with some vintage pattern weights. Sew the inner pieces to the large top piece. This will hold everything in place for the rest of the sewing. 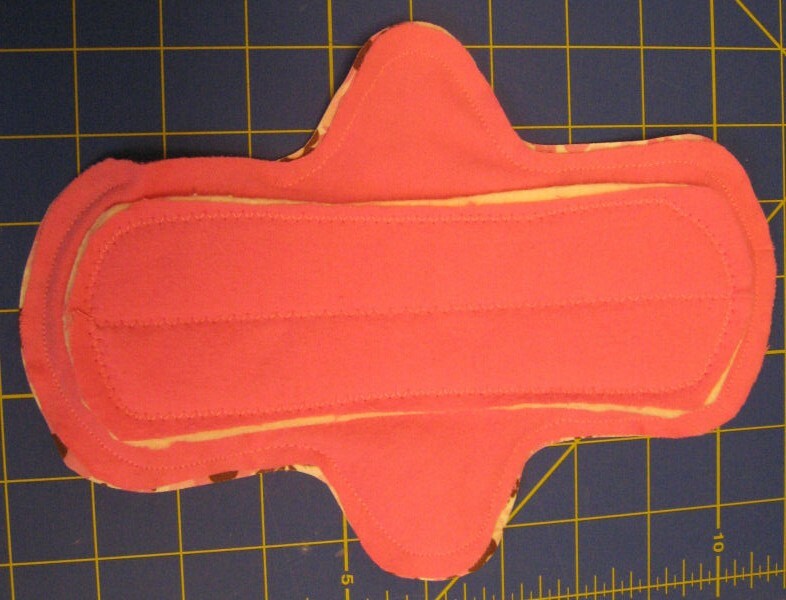 It also means the water resistant back piece doesn't get pierced by the channels sewn down the middle of the pad. I stack the pieces - first, the pink flannel outer piece (right side down), then the two inner batting pieces, then the pink flannel inner piece. You don't need the large floral outer piece yet. I line them up carefully, making sure there is a margin around the whole stack of inner pieces. I pin these together. With the inner side facing up, as in the picture above, I first sew a medium zig-zag down the center of the stack. (The pic is of another version, in different fabric, but should give you the basic idea.) This line of stitching will channel fluds to the center of the pad, and help to minimize bunching. (I use the "2" zig-zag width on my machine, which is about half the maximum setting.) I hold both ends of the pad and pull it taut while it goes through the machine, so that the fabric does not "creep" as I sew. I do not pull the fabric through the machine, as that would bend the needle. Instead, I hold the fabric taut, and let the machine pull it through. Once I've sewn the middle line of stitching, I continue all around the edge of the stack. It doesn't have to be right on the edge - in about 1/4" works well. The goal of this step is to anchor the edges of the inner stack to the outer piece to minimize bunching. 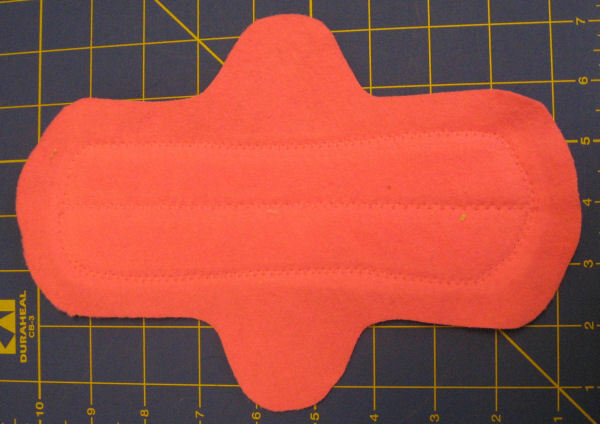 It will also help the pad's wings to fold properly. Once I am finished stitching, I flip it over, so the outer side is facing up. It looks like the picture below. This will be the top of the finished pad. Now I get the floral PUL outer piece. I flip it over - the white side is the back. 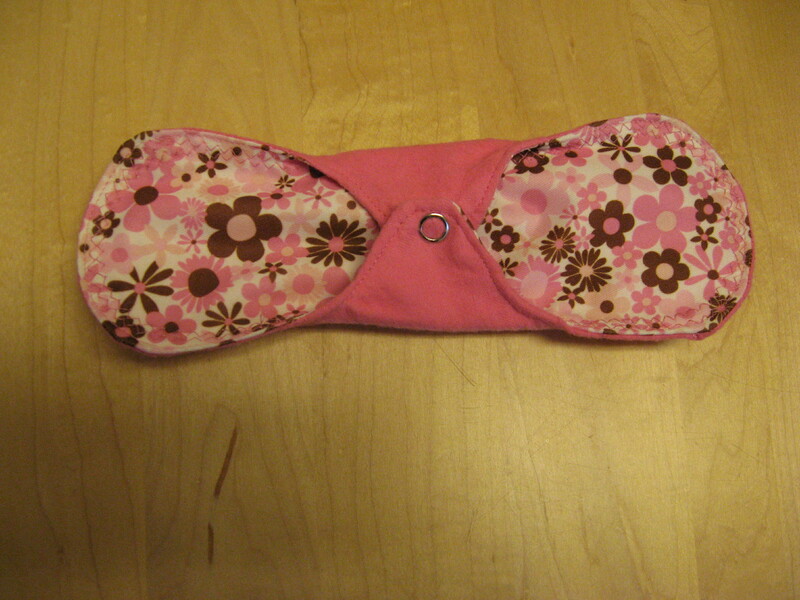 Then I place the floral PUL outer piece on top of the pink flannel outer piece, right sides together. (The right sides of the two outer pieces will be facing each other.) I pin the pieces together, putting the pins only in the seam allowance area so that I don't pierce a hole in the main part of the PUL. 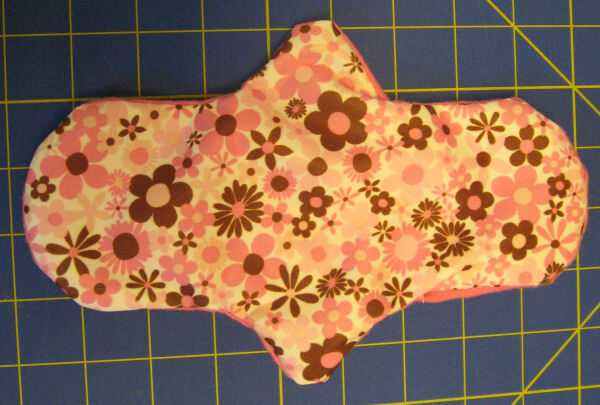 Flip the pad over so the inner part is on top - it will be much easier to sew this way. I then sew around the edge, using a straight stitch and a 1/4" seam allowance. 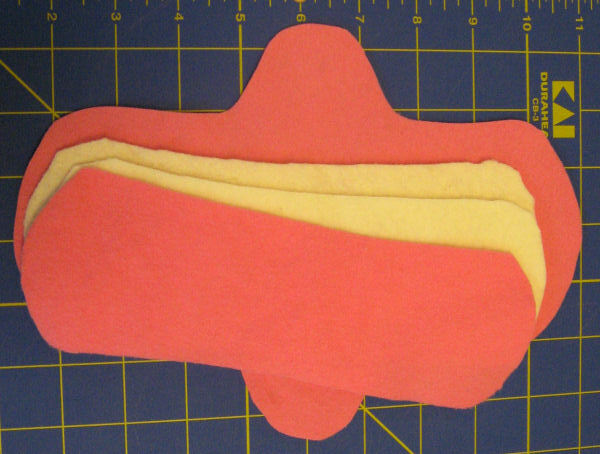 I leave a 2"section unsewn, for turning, preferably on the straight part of one side. It will look like the pictures below - the first picture is inner side up, the next is the outer side up. There will be a gap of approximately 1/4" between your seam line and the inner pad - after turning, this space will be taken up with the thickness of the inner padding and the seam allowances. If you don't leave this space, it is really hard to turn the pad and keep all of the inner layers smooth. Now I carefully turn the pad right-side-out, though the opening I left in the side. If it doesn't turn well, I may un-turn it and trim a little bit off of some of the seam allowance, especially on the tight curves of the "wings" parts, then turn it right-side-out again. The turned pad looks like the picture below. 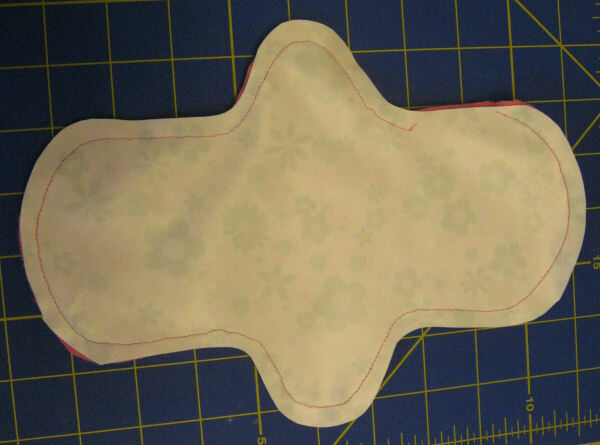 I straight stitch around the entire pad very close to the edge, which also closes the turning opening. I then apply a snap to each part of the wing. I double and triple check that I am putting the snap on the right way around before attaching it. 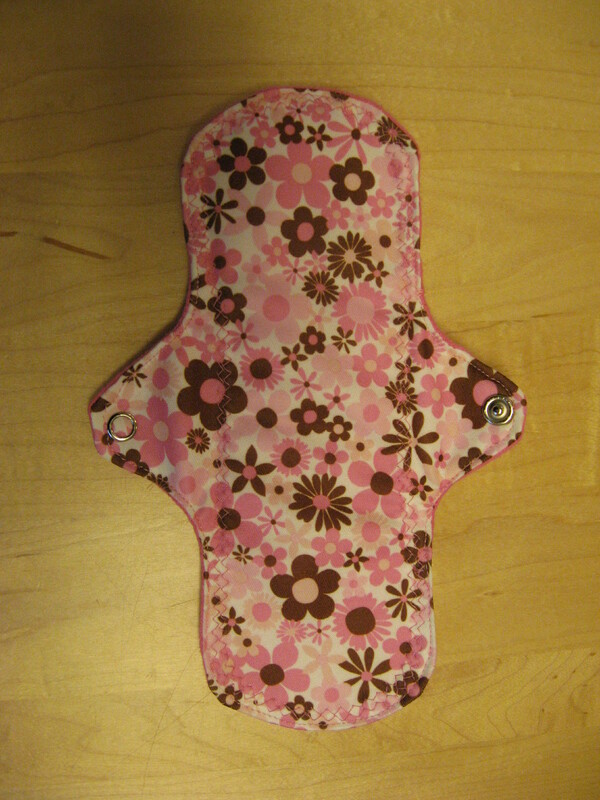 The floral part is water resistant and is the backing of the pad. 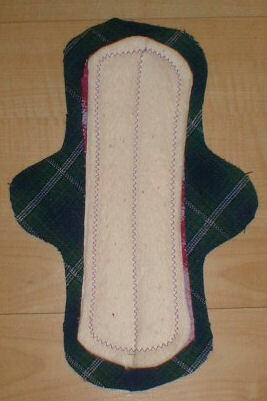 The pink flannel is worn next to the skin. 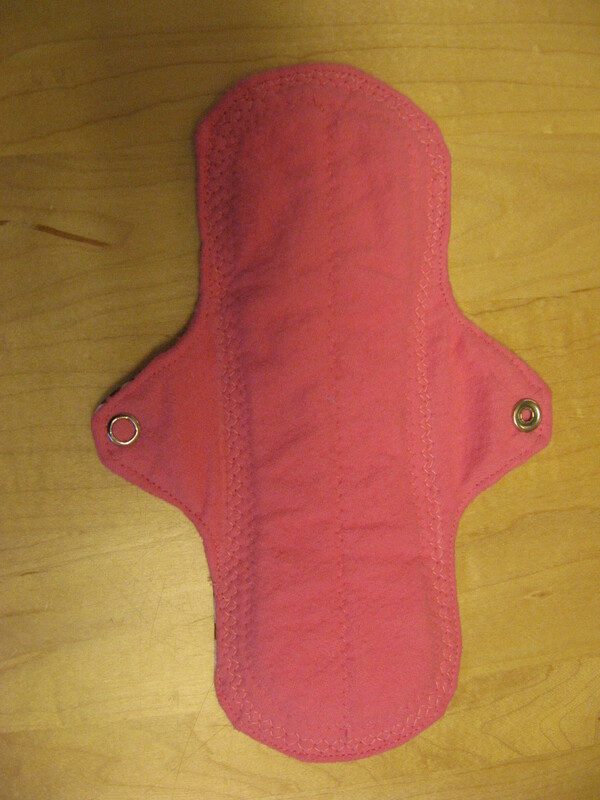 The wings fold back and snap to hold the pad to your undergarment. 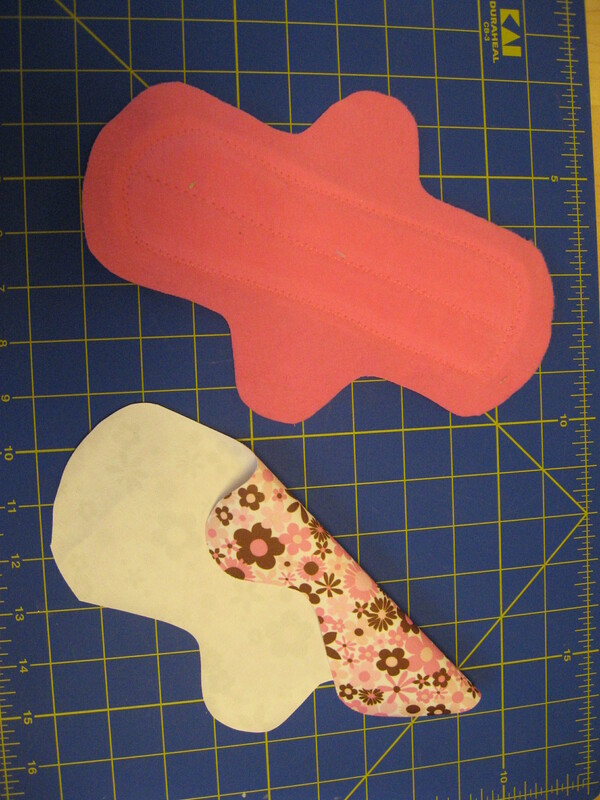 When not in use, the pad can be folded up and snapped, to put in your purse.